A Turkish ferry carrying automobiles and fruit caught fire Friday as it approached port in Sochi, a resort city on Russia's Black Sea coast, emergency officials said. The 21 crew members and 10 passengers, all Turkish citizens, were safely evacuated, regional emergency agency duty officer Sergei Petrov said. The ferry, which was sailing from the Turkish port of Trabzon under a Sierra Leone flag, caught fire about 1 kilometer (a half mile) from shore on Friday morning, the duty officer said. It was carrying six or seven sport utilities vehicles for sale, containers of fruit and marble. 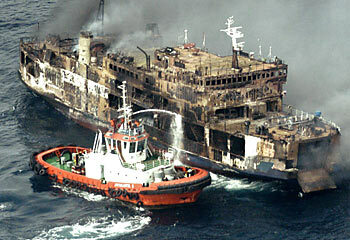 Firefighters on seven vessels were sent to try to extinguish the blaze, but were having little success, Petrov said. The burning ferry was blocking access to the port and was listing, and they had begun to tow it 15 kilometers (9 miles) out to sea, he said. The cause of the fire was not yet known, Petrov said. Sochi, a popular vacation spot, has beaches on the Black Sea and is a gateway to downhill ski resorts in the nearby Caucasus Mountains. Extensive development is planned for the city, which last month won the right to hold the 2014 Winter Games.